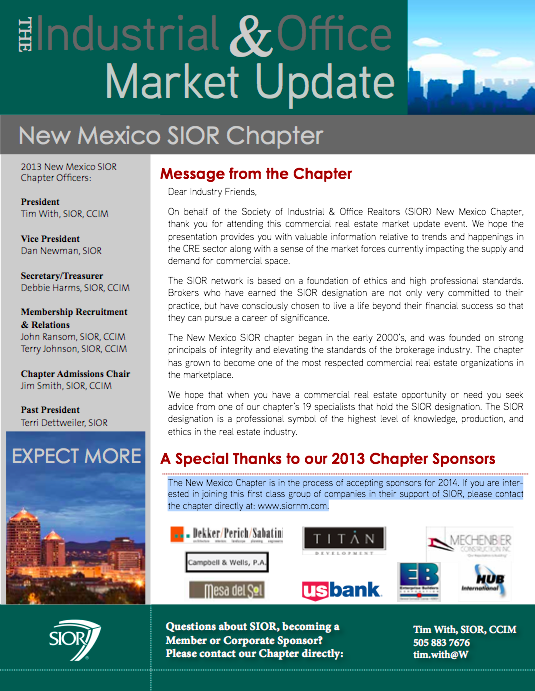 The SIOR New Mexico Chapter recently hosted its Industrial and Office Market Update at the November 25th NAIOP luncheon held at the Uptown Marriott hotel. Tim With, Jim Smith and Tom Jenkins were the presenters at this year's event. Click Here to download a copy of their powerpoint presentation. price and vacancy delta between Class A and Class B spaces is widening. in the country, although with smaller square footages than many cities. rate unless some other tenant moves downtown. The negative trend of tenants moving out seems to have hit bottom. door ratios of 2 or 3 to 1. Most older spaces do not meet these requirements. Predicting a 3 to 4% growth in rental rates annually. down land prices and growth in the industrial sector. Increased density has impacts for restroom facilities, HVAC capacity. Why consider new development of high quality space? Companies looking to relocate here will require multiple space options with large floor plates. At least two new, substantial office buildings will be developed in the near future.